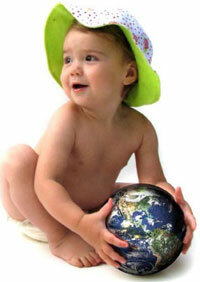 What could be better for baby – or Mother Earth – than kinder and gentler diapers made from corn? Corn-based diapers have apparently been around for a couple of years now, first made by a Swedish company called Nature Baby Care, but they are getting a bit more buzz lately. If you search around on the web, you will find a number of different brands of eco-friendly diapers and other websites specializing in places to find them – like Better Baby Bums, for example. You gotta love that name! Then there are companies like Earth Baby, based (where else?) in California, which offers “compostable diaper service” utilizing corn-based diapers. They claim they have composted over 9,600 pounds of diapers to date – turning them into nutrient-rich top soil in as little as 14 weeks. It gives new parents another alternative to cloth or traditional disposable diapers – and corn farmers a new use for their product!